DALLAS (AP) — Dirk Nowitzki’s debut in his record 21st season with the Dallas Mavericks won’t be in the opener. 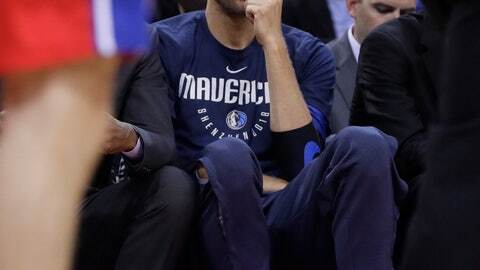 Coach Rick Carlisle said Friday the 40-year-old Nowitzki will miss “multiple weeks” with a longer-than-expected recovery from left ankle surgery in April. The Mavericks open the season Wednesday in Phoenix. Nowitzki said he had a setback when he started playing again about a week before training camp. He hasn’t practiced in the preseason. The surgery just before the end of last season was to remove bone spurs. Carlisle said the 13-time All-Star was doing better but hasn’t done any significant work on the court.